Georgia Tech’s President G. P. “Bud” Peterson, seated left, signed an agreement in a ceremony in Shenzhen, China, on Dec. 2 to create a new collaboration with the city of Shenzhen and Tianjin University. Co-signers with Peterson are Vice Mayor Yihuan Wu of Shenzhen Municipal People's Government, center, and Tianjin University President Denghua Zhong, right. A new educational collaboration among Georgia Tech, the city of Shenzhen and Tianjin University in China will expand global opportunities in science, technology and engineering education. Georgia Tech’s President G. P. “Bud” Peterson signed the agreement in a ceremony in Shenzhen on Dec. 2. The Georgia Tech Tianjin University Shenzhen Institute will offer majors in electrical and computer engineering, computer science, industrial design, environmental engineering and analytics. Georgia Tech will coordinate the graduate programs at the specialized institute, and Tianjin University, China’s oldest university, will coordinate the undergraduate programs. The Shenzhen government provided land, startup funding and operational subsidies. The vision is that the specialized institute will enroll 800 undergraduate and graduate students from throughout the world by 2020, and 3,000 students by 2030. It will present new opportunities for U.S.-based students, including study abroad programs and internships, and will expand Georgia Tech’s China Summer Program. Georgia Tech students study or intern in 70 countries, with 54 percent of undergraduates participating in an international work or study experience before they graduate. Georgia Tech faculty members are engaged in research collaborations in more than 100 countries. The Institute also has global centers in China, Costa Rica, Panama and Singapore. For 25 years, Georgia Tech has had a campus in Lorraine, France. “Having a full international campus is unusual, and we only do that when there is a compelling reason to benefit the institutions involved, as well as to provide a unique educational experience for students,” said Rafael L. Bras, provost and executive vice president for Academic Affairs. “Today’s agreement marks such an opportunity,” he said. The Shenzhen campus is designed to be self-sustaining, similar to Georgia Tech-Lorraine. Shenzhen is China’s high-tech capital and is often referred to as the “Silicon Valley of China.” Georgia Tech is a global leader in engineering and related fields, including leadership, interdisciplinary education, innovation and entrepreneurial education. Ten years ago, Georgia Tech launched the Georgia Tech-Shanghai Master of Science in Electrical and Computer Engineering (MS ECE) program in Shanghai. 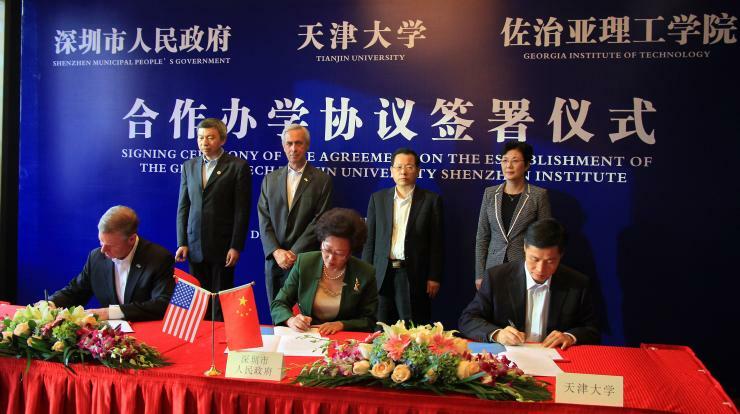 In 2013, Georgia Tech became a member of Shenzhen Virtual University Park — and was the first university from the U.S. to do so. The MS ECE program moved to Shenzhen in 2014, with philanthropic support from the Coulter Foundation. It became the first degree program offered in Shenzhen by an American university. Several other U.S.-based universities have similar agreements in other cities in China. Future plans for the Georgia Tech Tianjin University Shenzhen Institute include developing major research centers led by Georgia Tech’s world-renowned professors in green buildings and sponge cities, and distinguished by signal processing and data analytics, and wearable, printed electronics and advanced telecommunications.